Most of what I've done since the last blog post has involved testing different heating elements. In the process, I've built some muscles that I thought were good enough to film. They're slower than I would like (not just in the cooling phase, but also in the heating phase), but getting a proper driver circuit built might fix that. Blowing air on them helps them cool off faster, but I purposely avoided doing that so that you can see how long it takes them to relax in still air. First of all, I'm about ready to give up on the copper magnet wire. It's simply too easy to snap – even if I could make it work, I don't want a delicate, frustrating manufacturing experience, especially since I might end up making a lot of these. 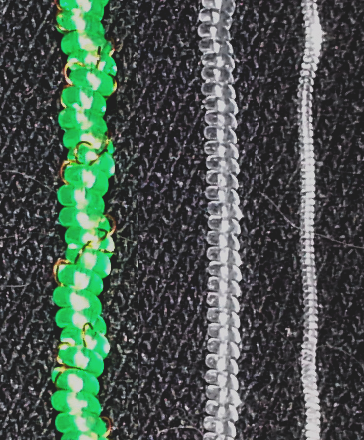 The first alternative I tried out was Beadalon 7-strand beading wire, which is made of stainless steel with a thin nylon sheath for insulation. It's highly flexible, and has a much higher resistance than the copper wire: about .30 Ω/cm, yielding a total of 14 Ω at the length I used. The same length of my copper magnet wire has a resistance of only 3.5 Ω (0.075 Ω/cm). (Don't set too much store by those numbers. My multimeter doesn't seem to be very good at reliably measuring resistances this small.) The total diameter of the wire and insulation is 0.46 mm. I made a homochiral (contracting) rod-coiled muscle using this wire and some of the 50 lb. test (711 um) nylon line, and got what I would call my first really good muscle. I was able to cycle it many times without damaging it and making the coils go flat (a problem I had previously with the muscles that used the copper magnet wire). It contracted enough to lift a suspended ferrite core about 1 cm. The main disadvantage of this wire, as compared with the copper, is that it heats up much more slowly, and I think it cools more slowly as well. This could be due to its higher resistance, which would have reduced the current flowing through the wire (I've been using about the same voltage for all my tests). Or it could be mainly due to the insulation limiting the rate of heat transfer from wire to muscle. I also tried some tinsel wire – multiple strands of enameled copper wrapped around a fiber core – which I scavenged from the cord of an old pair of headphones. This is my favorite heating element so far. It doesn't break easily, it heats quickly, and it's less bulky than the Beadalon wire, because it's insulated with enamel rather than a nylon sheath. 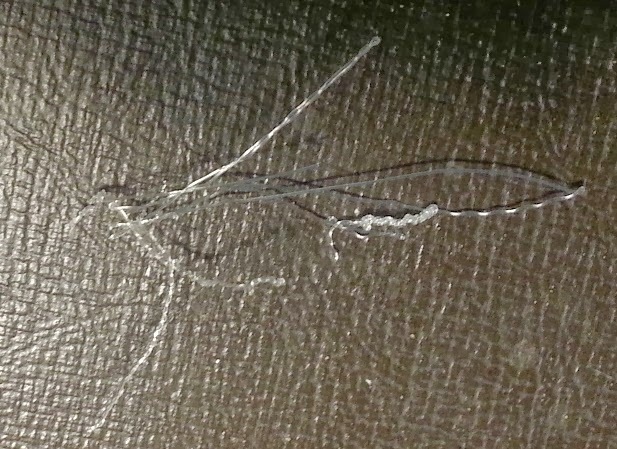 When it's put under tension and wound up into a muscle, the strands shift and flatten so that the wire takes up very little vertical space between the coils, and it spreads out a little to touch a greater surface area of the nylon. I made a heterochiral (expanding) rod-coiled muscle with this stuff. In the comments of a previous blog post, bluesmokelounge suggested using a heating wire without any enamel, presumably to get quicker heat transfer. I'm a little wary of doing that. Loops of wire on adjacent muscle coils can contact each other when the muscle is fully contracted, and would short together without insulation, throwing off any calculations based on the length of the wire and possibly causing uneven heating. If the muscle were cycling continuously, this condition would be momentary, but it could be more of an issue if one wanted to hold the muscle in a contracted state for a while. If I tried to list the video games that have strongly impacted my life, the first ones that came to mind would have powerful narratives, but there are a few cases in which the gameplay itself had an influence by helping to develop my mind. I'm referring to my childhood collection of “edugames.” I had many of these, but I'm going to focus on just three standouts. Why these three? Because I loved them so much that I STILL PLAY THEM NOW, even though the puzzles are more of a tease than a real exercise for my brain nowadays. In this article, I'll be featuring The Castle of Dr. 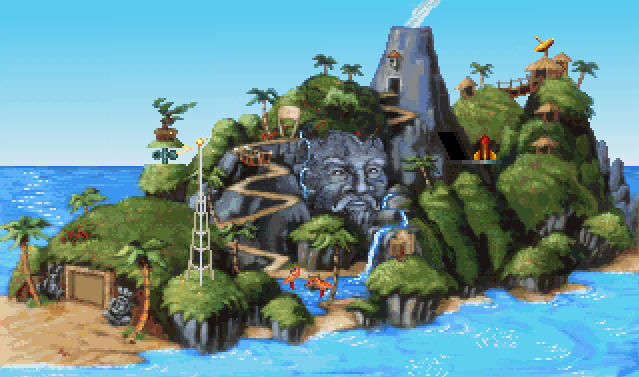 Brain and its sequel, The Island of Dr. Brain1. This is no ordinary island. Both edugames were produced by Sierra during the “golden age” of adventure games, so they share many stylistic similarities with classics such as King's Quest V. Castle was even directed by Corey Cole, famous among fans of adventure games for his work on the Quest for Glory series and other well-known Sierra titles. However, the Dr. Brain games are played in the first-person, are more linear than a typical adventure game, and have simple plots that serve mainly as a background for the puzzles. In Castle, you're trying to apply for a job as the titular Dr. Brain's lab assistant, and it turns out that his idea of an interview is making you prove your worth by opening numerous puzzle barriers to reach the castle basement. In Island, you've been hired, and you're tasked with retrieving a special battery from Dr. Brain's island fortress … but for security reasons, you again have to deal with a bunch of puzzles in your way. The environments through which the player travels are mysterious and whimsical, and full of objects that deliver silly animations or descriptions when clicked. Much of the castle interior and some of the island labs get a bit dark and oppressive, though. I guess Dr. Brain has to keep up that creepy mad scientist mystique, even though he's officially opposed to violence. The graphics consist of hand-painted scenes rendered into pixelated backdrops suitable for the computer screens of the time. Since a number of people love this “retro” look and are still creating games in that style, I can say that they've aged well … and if you don't mind the mosaic-like appearance of the art, it's still very attractive. The robot room of Dr. Brain's castle. Which head is being honest with you?? The games are more broad than deep, providing a very basic introduction to many different fields and whetting the player's appetite for more. Both titles feature puzzles that cover pattern recognition, sequences, spatial reasoning, mathematics, simple programming, digital logic, and cryptography. Castle also includes a memory game and a bit of astronomy. Island adds navigation, foreign languages, chemistry, genetics, music, mechanics, and art history. (Salvador Dali was probably my favorite of the featured artists; obviously, youthful me already had a taste for the weird.) Island also comes with a neat companion book called the EncycloAlmanacTionaryOgraphy, which provides background information helpful for solving and fully understanding many of the puzzles. Although the Dr. Brain games only scrape the surface of each topic, I'm surprised by how useful, or at least interesting, the provided bits of information are. They constituted my first (I think – it was a long time ago) introduction to binary numbers, logic gates, ciphers, Fibonacci numbers, dominant and recessive genes, and that lovely sequential puzzle called the Tower of Hanoi. Some of the concepts gained here are things that I still use, though they've been supplemented by layers of additional depth. The games also made the knowledge that they presented fun and engaging. They fascinated and inspired me enough that I did some outside activities inspired by their puzzles – for instance, I made my own polyominoes out of paper, as suggested in the EATO. 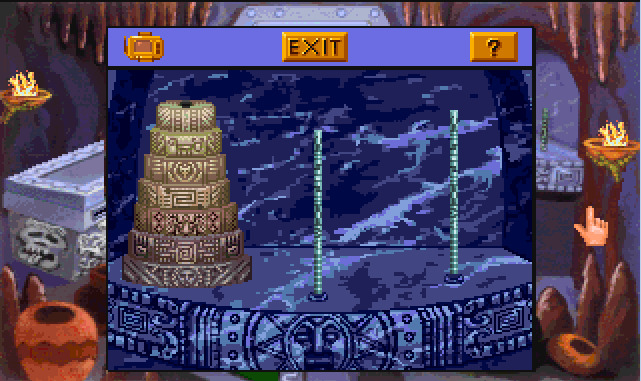 The hardest level of the Tower of Hanoi puzzle. I think the adventure puzzle format followed by the Dr. Brain games had a lot to do with their appeal, at least for me personally. The linear narrative gave me a sense of accomplishment; it was possible to reach the end of the game and achieve some worthy goal in the process. The exploration element provided a little thrill of discovery as I opened up each new area. And perhaps most importantly, the puzzles were varied, interesting, and thought-provoking. In Island you can accumulate a higher score by completing the puzzles over and over, but the game will never force you to do this. I don't remember games like Math Munchers with nearly as much fondness, because they were basically the same dull rote exercises I was made to do for homework, with a layer of arcade action and cartoonish animation plastered on top. I went from being bored when the Troggles (enemies) were turned off, to frustrated when they were turned on. The Dr. Brain games avoided both of these problems by including puzzles that were inherently engaging and letting me solve them at my own pace. I've got one more edugame that I want to talk about, but I'm going to save that one for another post. 1. There are two more games in the series, The Lost Mind of Dr. Brain and The Time Warp of Dr. 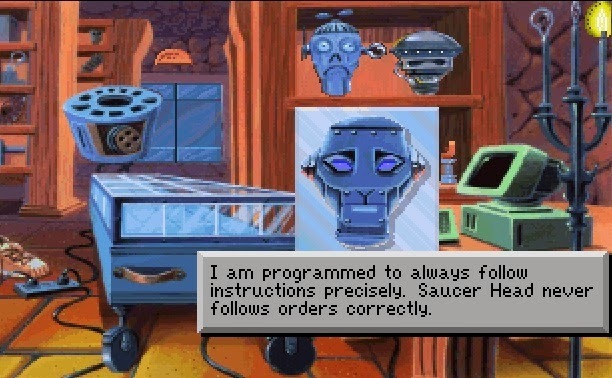 Brain, but I never got to play more than the demo of Lost Mind. It feels very different from the previous two games, and didn't strike me as having the same appeal. Maybe I'll have to give it and Time Warp a proper try someday. It's time for some updates on the artificial muscles made from nylon fishing line. In case you missed the last blog post, I'm trying to replicate the research results described in this news article: http://io9.com/scientists-just-created-some-of-the-most-powerful-muscl-1526957560 I've successfully demonstrated Phase II of the project: activating a muscle with heat produced by electricity running through a wire. First, though, there's some unfinished business from Phase I to talk about. There are a couple of basic ways to coil the nylon filaments. The first is to twist the filament as tightly as possible without causing it to form secondary coils, then wind it around a rod. I'm going to refer to the results of this technique as “rod-coiled” muscles in the future. The second is to keep twisting the filament until secondary coils form all along its length, without any need for a rod in the center; I'll call these “self-coiled” muscles. I was having trouble making self-coiled muscles as of my last post. Rather than forming secondary coils, the filament wanted to bunch sideways, forming whiskers that extended horizontally away from the line. Self-coiled filament close-up. Left to right: 711 um filament with wire, 533 um filament, 381 um filament. Cousin Clear Monofilament, test strength 8 lb., estimated diameter 0.015 in. (381 um). I had to guess the diameter, since it's not advertised on the package. Zebco Omniflex, test strength 25 lb., diameter .021 in. (533 um). Trilene Big Game, test strength 50 lb., diameter .028 in. (711 um). This stuff claims to have “Extreme Fighting PowerTM,” and it's bright green, lest you forget how Extreme it is. 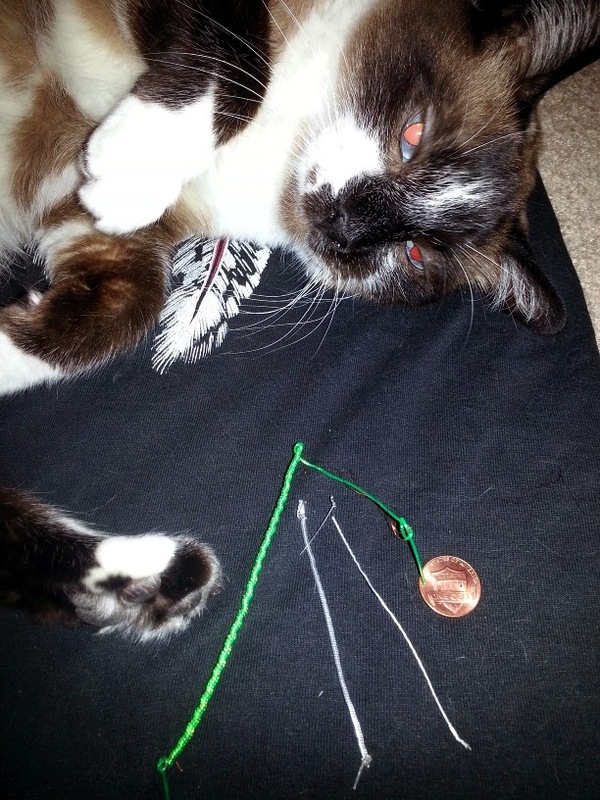 The self-coiled muscles again, with a penny and a cat for scale. The ability to make the self-coiled muscles opens up new possibilities. They have a larger spring constant than the rod-coiled muscles, and can therefore support and lift heavier loads. However, I suspect that there is a trade-off between the maximum contraction force and the maximum contraction length. The loops of the self-coiled muscles are already very close together, so there just isn't anywhere they can go. The loops of the rod-coiled muscles spread farther apart under load, and contract dramatically when heat is applied. For this reason, I recommend making a rod-coiled muscle for your very first tests … it's just easier to see whether it's doing something when you heat it. Also, you can only get heterochiral muscles that expand when heated by using the rod-coiling method, as far as I know. Perhaps the most convenient way to supply the temperature change needed to activate the muscles is by electrically heating them. I made several muscles that were supplied with a resistive heating element, in the form of a piece of magnet wire twisted into the muscle. “Magnet wire” is very thin copper wire with a coating of insulating enamel. I salvaged mine from the coil of an old electromagnet, so I don't know its exact thickness. For my most successful experiment, I made a homochiral rod-coiled muscle from the 711 um line, with a single magnet wire wrapped around the line. (I tied the nylon line and the wire together at the ends, so that wire and line were twisted together during the coiling process. 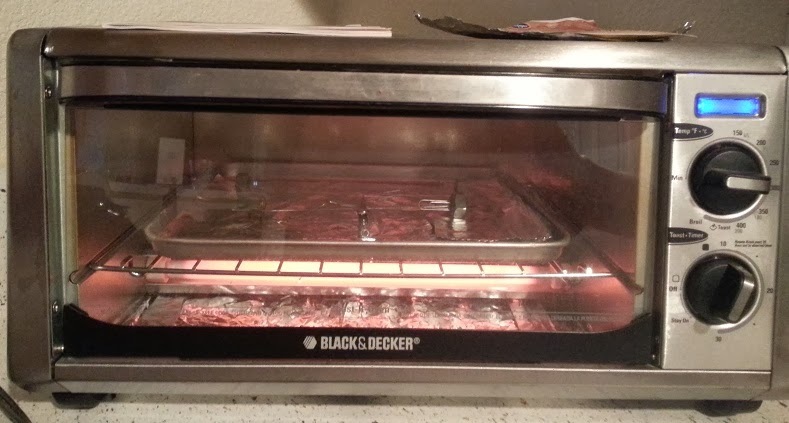 Then I wrapped the two around the rod and annealed the muscle in my toaster oven.) I loaded the muscle with a pair of ferrite cores, weighing (I estimate) about 30 g. I was able to see it contract and lift the cores a millimeter or two when I connected the wire to a 6 V battery pack, and relax again when the electrical current was removed. Not much, but it proves the concept. Ideally, the muscles would be run by a controller which would first provide a burst of high current for quick heating, then back it off to avoid exceeding the maximum temperature of the muscle. A small amount of current could then be maintained to hold the muscle in its contracted position, if desired. My “quick and dirty” version was to simply hook the battery pack to the wire and disconnect it as soon as I saw the muscle start to move. Given the length of wire I was using (about 60 cm) and a voltage drop of ~6 V, the amount of heat produced is enough to permanently deform the muscles and eventually melt them in half, if the current is left connected too long. So one must be very careful and have quick reaction time if working with this much voltage. My muscle would heat up enough to show a response within a few seconds, and relax within maybe 15 s or so. 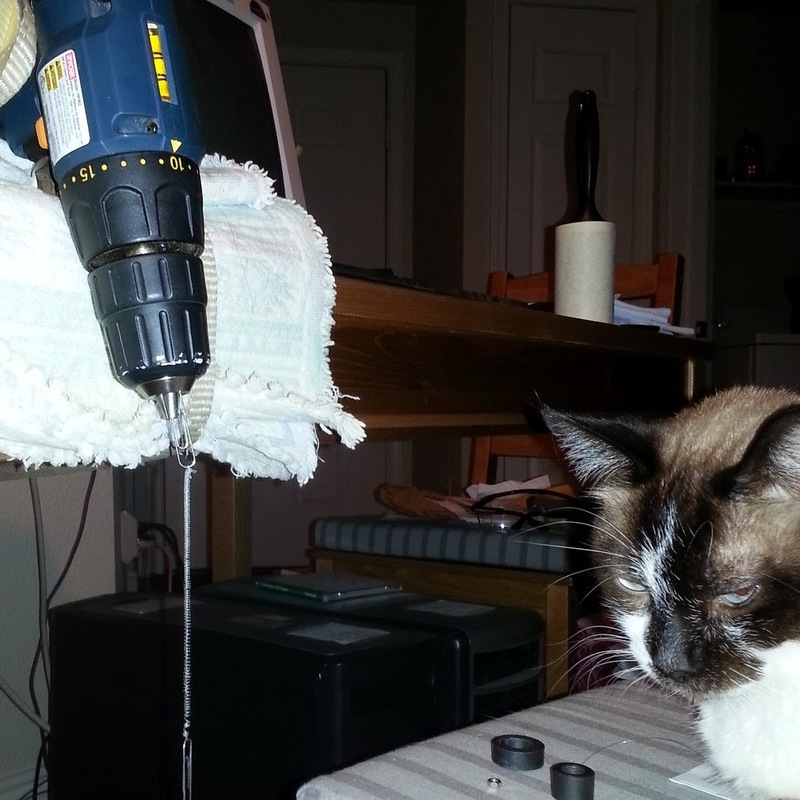 Besides the ease of overheating, the other major annoyance was working with the magnet wire itself. It breaks very easily when it experiences strain as a result of being coiled up with the muscle. I don't think I made a single 711 um muscle without having the wire break – for my successful tests, I either manually wrapped some wire around the muscle after it was coiled, or pulled one of the broken ends out of the middle of the muscle and stripped it so I could get a connection point. Come up with a way to make muscles reliably without constant wire breakage. I plan to investigate some other possible resistive heating elements, besides the single strand of magnet wire. Calculate the heat dissipated by the wire, and find maximum “safe” voltages for muscles as a function of their parameters. Use a microcontroller and driver circuit to control a muscle. Experiment with a variety of muscles and get more details on lifting power, maximum compression or extension, time to contract/relax, etc. I'm just wrapping up a comparatively long stint of working on a novel. I don't want to post any teaser text from the actual story yet (mainly because I don't really know when it will be done, and would rather not have anyone clamoring for more at this point). Instead, I thought I'd put up a few worldbuilding notes that I worked out before I started writing. These are a work in progress; I find that I learn more about the setting as I work on the story, so I go back and edit my notes now and then. There are four intelligent creature races in the world I'm working with (possibly five, but nobody knows much about the last one). I'll introduce one of them here, and save the rest for other times when I don't have robot stuff to talk about. This particular race grew out of my mulling over how a society of wolf-like creatures with human-level intellectual tendencies might operate. All concept art and notes here are copyrighted by me; please respect that. 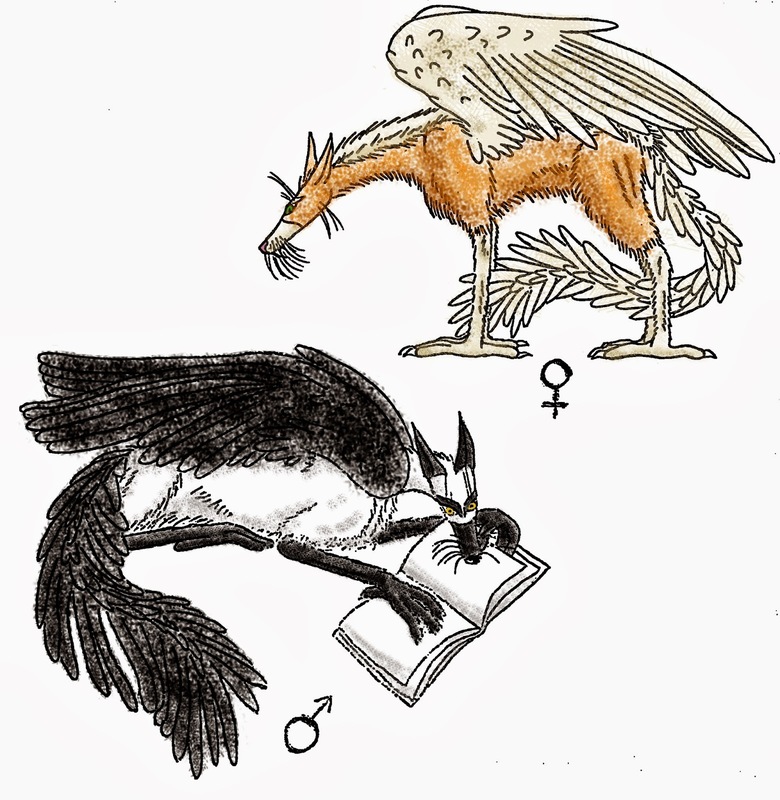 The Lilkirgynyyn (singular: Lilkirgyn) are a race of winged quadrupeds, vaguely canid in appearance. Although historical records suggest that they were once widespread, today they dwell in rugged regions that other races find unfavorable: the far north, the peaks of high mountain ranges, deserts, and impenetrable swamps. Proud, serious, and scholarly, they view themselves as the keepers of the world’s knowledge, and mock the other races’ ambitions for territory and sensual pleasures. This attitude means that they are often the losers in any serious confrontation – they simply don't have the ambition to build up a powerful military. Having grown to expect that the Krippin and Rynsor will overwhelm them, they have become withdrawn and elusive, and most of them have few dealings with outsiders. It is believed that they were the first of the races to discover and understand mathematics, and the first to invent a written language. Their patron is Kyrysyn, the Spirit of Truth and Logic. A full-grown Lilkirgyn attains roughly the same size as a greyhound. They possess some avian features, including hollow bones and a curious respiratory system which allows air to pass through the lungs. Rather than being trapped in air sacs and returned through the lungs to the mouth or nasal cavity (as in birds), the air passes along the whole length of the body and is exhaled from vents on the creature’s thighs. Females of the species are lighter in appearance than the males, grow a short, fluffy mane along the spinal column, and have long upper canines that protrude outside the mouth when it is closed. Barring rare mutations, Lilkirgynyyn are always bicolored, with one color on the main body and a secondary color on the “points.” White with black points (the “mountain phase”) is by far the dominant coloration. Red with pale yellow points, rust or tan with white points (desert phase), and brown or charcoal gray with black points (forest phase) are other common color combinations. A few more exist, but are quite rare – perhaps throwbacks or remnants from Lilkirgyn populations that were nearly driven extinct by past wars. Lilkirgynyyn are long-lived creatures, with an average life expectancy of 120 Senticronian years. Heavily furred, they do not wear clothing, aside from ornamental accessories and protective armor. The Lilkirgynyyn are obligate carnivores. They do not appreciate this, and associate it with a curse bestowed on them for some great wrong performed by their race in the distant past. Due to the shame associated with the curse, they have a taboo against eating in public. All food is obtained by hunting; the Lilkirgynyyn consider the killing of a tame or helpless animal dishonorable, and thus do not keep livestock. However, they alarm and disgust the other races by eating the bodies of their own dead, and keeping the bones and hides for use as tools. (They do not murder each other for food, as is sometimes falsely claimed in rumors, but the body of anyone who dies of natural causes or in battle is fair game.) The Lilkirgynyyn, for their part, have trouble understanding why the other races “waste” the empty shells of their comrades by burying or burning them. Like many canids, the Lilkirgynyyn form packs, and these constitute their basic social unit. Packs typically have three to ten members, all of whom are fiercely loyal to each other. Sometimes the descendents of a Lilkirgyn pair remain with their parents into adulthood, forming a multi-generational pack. Others leave their parents’ pack at maturity, and collect with unrelated individuals whose goals and ideals they share. The Lilkirgynyyn recognize a distinction between these two types of groups, calling the former “body packs” and the latter “mind packs.” Both types are more or less equally respected in Lilkirgynyyn culture, and each has a loosely assigned role to play in society. The body packs are seen as a conservative force, whose goal is to preserve tradition and pass down old knowledge, while the mind packs are the champions of novel ideas, and the bringers of renewal and progress. Lilkirgynyyn have one given name, and use the name of their pack as a surname, connecting them with the pronoun tyryn. Most of the significant social bonds a Lilkirgyn forms will be made with pack members; they are known for being cool and formal with anyone not belonging to their exclusive group. Once firmly entrenched in a pack, a young Lilkirgyn will usually remain with that pack for life, unless he marries a member of a different pack. When this happens, either one of the pair will join the other’s pack, or the two will split off on their own, hoping to become the founding members of a new body pack. The departure of an established member is always trying for a pack, and many of the murders in Lilkirgyn society are motivated by the pack’s jealousy against a lover who is preparing to “steal” one of their companions. It might even be accurate to say that, for the Lilkirgynyyn, pack bonds are generally stronger than pair bonds. Fortunately, young Lilkirgynyyn develop romantic attachments early, and lovers usually end up joining the same pack to begin with. Hence stressful pack splits are relatively uncommon. Although the Lilkirgynyyn take marriage very seriously once it has been entered into, they are less likely to marry in the first place than are most of the other races. About a third of the population remain single (and, usually, celibate) for their entire lives. This behavior partially accounts for the race’s slow rate of population growth. Single Lilkirgynyyn participate in the raising of other pack members' children. There are very few Lilkirgyn loners. Most of the ones that exist were never truly part of a pack to start with. Other Lilkirgynyyn think of them as aberrant or eccentric, and the more prejudiced among them actively shun loners. For a normal Lilkirgyn that has become established in a pack, isolation or ostracism is devastating. Packs only expel members for the most terrible crimes, and in such cases, killing the offender is usually judged more merciful than sending him away. Individuals who are lost or otherwise separated from their packs may waste away and die, even if they are taken in by another pack. The sole survivor of a slaughtered pack seldom retains the celebrated rationality of his species. He may collapse and let himself be killed or captured, or he may fly into a terrible berserker rage and fight to the death. These social traits have made it impractical for Lilkirgynyyn to be taken as slaves, as the other races have discovered with disappointment over the years. Separated pack members promptly fall ill or go insane, becoming useless for any sort of work, and a pack left united is nearly impossible to break to obedience. Packs cluster together to form clans, the next level of social organization. The clans form the basis of Lilkirgynyyn government, but the level of formality varies greatly from one clan to the next. Some of the larger clans possess laws or codes of conduct, courts of justice, taxes, elections, administrators, and the like. Smaller clans often function more like extended families or local communities, in which disputes are resolved and needs provided for through informal discussion and action. The most common system for choosing clan leaders is to subject candidates to a contest of skill, and anoint the winner leader. Unlike the individual’s membership in a pack, a pack’s membership in a clan may be quite fluid. Some packs have changed clans several times in a generation, as the interests and loyalties of their members evolved. The highest level of Lilkirgyn social organization is the nation, but the word has a very different meaning for them than it has for, say, the Krippin. A nation of Lilkirgynyyn is a loose grouping of clans, usually based on geography. It has no centralized government, seldom imposes any universal laws, and most likely does not even have a formal charter. Rather, it exists in the form of understandings and promises of mutual aid between many clans. Although a Lilkirgyn might take pride in his clan, he would think it strange to feel any great sense of loyalty to his nation – it is too vague an entity to excite feelings of patriotism. Nations only exist to bring large numbers of Lilkirgynyyn together in times of emergency or monumental enterprise. They rarely go to war against each other, as conflicts are judged to be the private business of the clans directly involved, even if they belong to two different nations. However, an entire nation is likely to mobilize if it faces an attack by members of some other race.